Happy Solstice to all from Brookfield Farm Bees And Honey here in Maple Falls, Washington. The entire family gets behind the return of longer days here in the Cascade foothills. To celebrate most of us go for a walk in the woods to pick out our Solstice Foliage. Did I mention that the “family” includes dogs, goats, and cats? Of course it’s the goats who become totally involved in the choice. We want the best tree. Some feel cedar is the right spirit (or taste). Then there is the minimalist in the group: no greenery, just the bare beauty of wood. As in all holiday gatherings, some family members become bored after a bit. Then there are those who prefer to just wait and have it brought to them. The “did anyone mention how cold it is out there” group. After the usual holiday squabbles, banging of heads, a bit of barking, and the human yelling “Don’t eat that. It’s for Solstice!”, we made it home. Long stored decorations were pulled out, and everyone except the house cat lost interest because, well, they can’t eat it until New Years Day. As for the bees, they are clustered up in their hives. I do not bother my bees in the winter. It’s too cold. They’ve been left ample honey (1.5 supers), and pollen (1 super). They’ll be checked in February, when we normally get a brief break in the cold. But that check only involves lifting the top and seeing if they’ve reached the top or if they have honey left. If they’re at the top, they will get some bee candy. 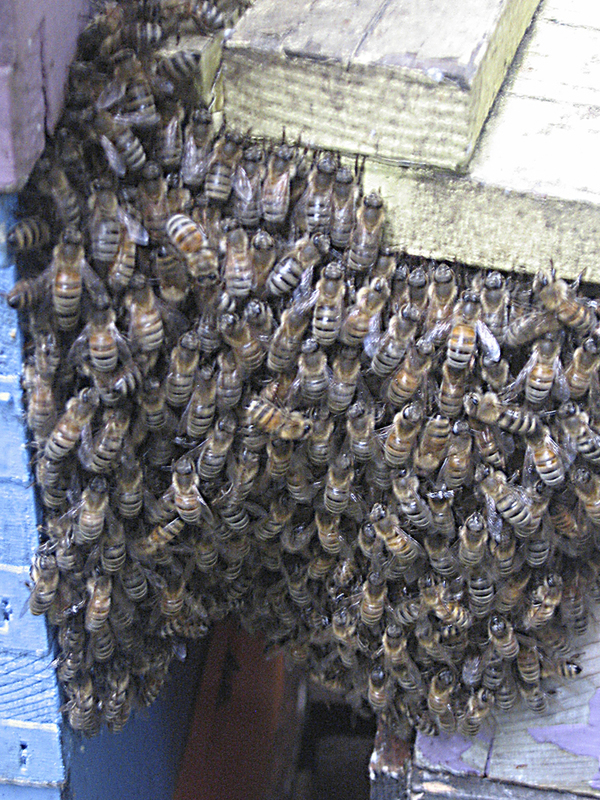 With luck they’ll come out happy and healthy in the new year raring to reproduce and make honey. That’s the news from Brookfield Farm Bees And Honey, in Maple Falls Washington. So far the winter has been mild compared to last year (thank goodness), but it’s only the beginning of winter here – three months to go. I have no idea why wordpress is formatting this with so much “negative space”, but I gave up trying to understand the internet years ago. Happy Solstice To All from all the creatures at the Farm. I am labeling honey to take to the Seattle’s Ballard Farmers Market, where I have a booth every Sunday 10-3. When I got to the fabulous honey from my friend Mark at Northwest Queens, in Arlington, Washington, I realized I had a perfect time to muse about how honeys can be different from hives that are close together. Mark takes his hives upriver on the Stillaguamish – a river that starts in the high Cascades in northwest Washington state, flows down through meadows and past Mark’s hives, then heads west to the city of Arlington and out to Puget Sound. Mark’s has a number of bee yards in the upriver meadows, but they are relatively close to each other. This year they produced very different honeys: some light, some dark. We will have both at the Brookfield Farm Bees And Honey booth – possibly not at the same time, but I’m betting we have some overlap. They are both delicious, but quite different. Bees fly approximately 2.5 miles from their hives. Some go further, some stay closer if there is an ample floral source in the area. Flowers can change dramatically in 2.5 miles: both in what flowers are available to the bees, and when those flowers will bloom. Sunlight, soil, and elevation are only three of the factors that can affect bloom time. If you’ve planted a garden, then traveled to friends to find their gardens blooming sooner or later than yours, you’ve seen this for yourself. Our area has an invasive species called “Japanese Knotweed”. It has taken over many of our streams and rivers. It is nearly impossible to eradicate (although I don’t think they’ve tried goats yet – goats eat an amazing array of things). It does produce a very nice black honey. Mark was not after black honey. His goal was the light honey that is traditionally produced in the upriver meadows along the Stillaguamish. In one area, the Japanese Knotweed bloomed earlier than ever before. Mark’s bees found, and enjoyed the nectar. Thus we have two styles of Stillaguamish River Wildflower from Northwest Queens this year. 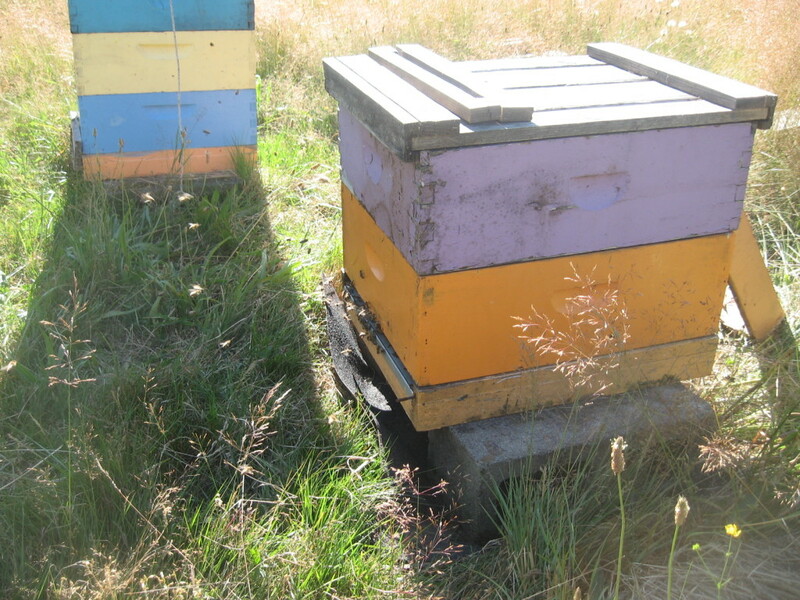 Most beekeepers I know in Washington State have commented that everything seems to be blooming about three weeks sooner than “normal” – “normal” being the seasons we have become accustomed to over the last decade. Honey changes between bee yards, and from year to year. I once had a customer who was surprised by the change in honey from one year to another. She said she would wait to buy honey “until next year when it’s like it was before.” I had to let her know that it might never be “like it was before.” Indeed that honey, from northeast Washington, changed dramatically as a two-year drought hit the area, disappeared completely when massive fires roared though in the third year, and has returned with a whole new taste as fireweed bloomed in profusion amid the other returning wildflowers following the fires. When you find a honey you enjoy buy enough to store. Remember: honey lasts forever. That’s the news from Brookfield Farm Bees And Honey in Maple Falls, Washington. It’s still snowing here, and the way to the farm remains passable, for the moment, in low 4-wheel drive and chains. I know folks up here love the snow. I would too if it would just stay up on the mountains and leave the foothills snow free. I just have to remind myself that enduring the snow is the price I pay for living in one of the most beautiful places on earth. I’m back. I have been away from the blog world for a while. 2016 was not a good year personally or bee-wise. At the moment it is snowing, so not a lot to talk about regarding the bees. Spring has arrived in Whatcom County Washington (the northwest corner of Washington state). It has arrived two weeks earlier than last year, which was early as well. The sun and flowers emerge fast on the heels of a very web February, which is good: lots of water then sun equals lots of nectar (in concept). But before the bees can easily work these coming flowers, their hives must be tidied from their post-winter configurations. All my hives are in western (mediums). I over winter in a stack of four boxes. When winter starts there is pollen in the bottom box (the bees keep it there); brood in the next box; brood and honey in the third box up; and honey in the fourth box. I leave 70 pounds of honey on each hive. The images here are from a small, 4 hive, beeyard near the farm. A small beeyard gives me time to take pictures. And, well, it’s a lovely view, isn’t it? The same yard after manipulation appears at the end of this post. The bees have moved up into the upper boxes. The bottom screen has dead bees on it. The bottom box is empty. The bees have consumed their pollen. Sometimes a hive will have some pollen the bees didn’t eat, which has molded – this isn’t harmful to the bees, they a long way from that box by spring. The second box is usually empty. Sometime with an especially strong hive there will be a touch of brood in the very top of it. 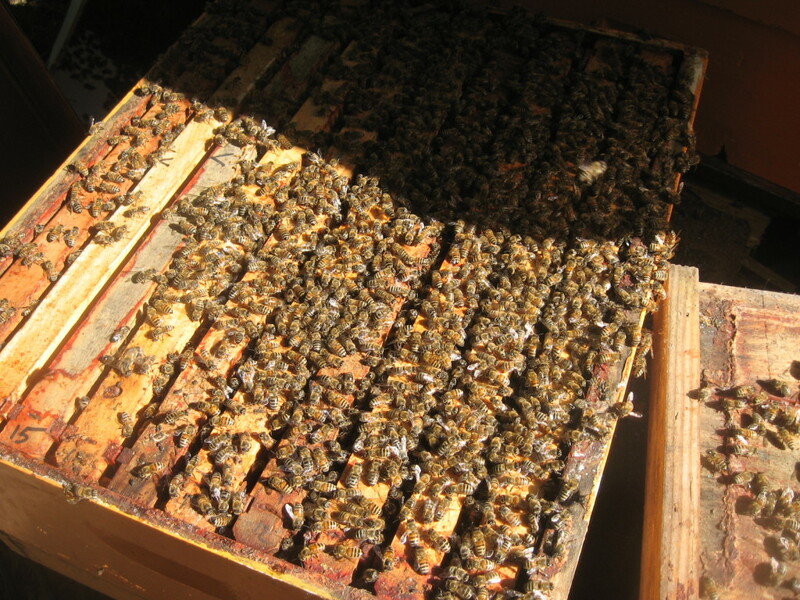 The fourth box usually has some honey with the center frames empty or with brood. Sometimes this box is full of bees and brood and they are rapidly running out of stores. Sometimes this box is filled with honey, and the bees are honey-bound going into spring. If I were to leave the boxes as they are in the spring, a few things could happen: 1) the bees would swarm – they think they’ve filled all their space, 2) they would be living on top of all those decomposing bees on the bottom screen, and 3) I would run out of equipment with all those empty boxes below them. I kind of “flipped” the boxes. When one works with 2 deeps, this is literally: put top box on bottom, put bottom on top. It’s more complicated with four boxes – but lighter. The bottom screen is cleaned: dead bees knocked off. I use bottom screens all year long, no solid bottoms ever. The screens are dry as are the dead bees. I love bottom screens. The bottom box and second box from the bottom are set aside – again, these are usually empty. Now the manipulation begins, and it all depends on open brood, sealed brood, and honey stores. The third and fourth boxes will become the first and second boxes, but each hive is different. As I work, I clear the burr comb that has accumulated during winter. In the spring, this can have drone larva on it. In my hives it is unusual to have much drone comb in March, but this year I have emerged drones, many of which are sexually mature already. These are queen right hives. There’s just a lot of drones in the strong ones. Sealed brood. I like to put this here because they’re going to emerge soon and leave all that nice space for the queen to use for eggs. Again, the box stays as the bees laid it out. The brood nest remains intact. If the cluster is small, but viable, honey is put in the second box and the stack ends here. If there has been a bit of brood in the old second box, they go here. The formation keeps the brood nest intact. Now I move frames. I make sure that there are newer, empty frames for the queen to use. If the honey frames are out on the edges, I move them closer to the center – around places 2or 3 and 7 or 8, it’s a judgment call. I figure they’ll consume the honey before they need the space. If all the honey is in the old fourth box, then I’ll use that honey, while leaving some in the new fourth box. Sometimes the hive looks like it will take a while to fill this, and the stack ends at the third box. This is only for hives that are really strong: lots of eggs and brood (open and sealed). In effect, I’m “supering” the hive. If there is wall to wall honey, this is broken up – usually into the box below, while leaving some in the fourth box, usually around frames 3 and 8 – the maybe checker-boarded, maybe in a group, it really depends on the hive. I always leave spaces 5 and 6 open. 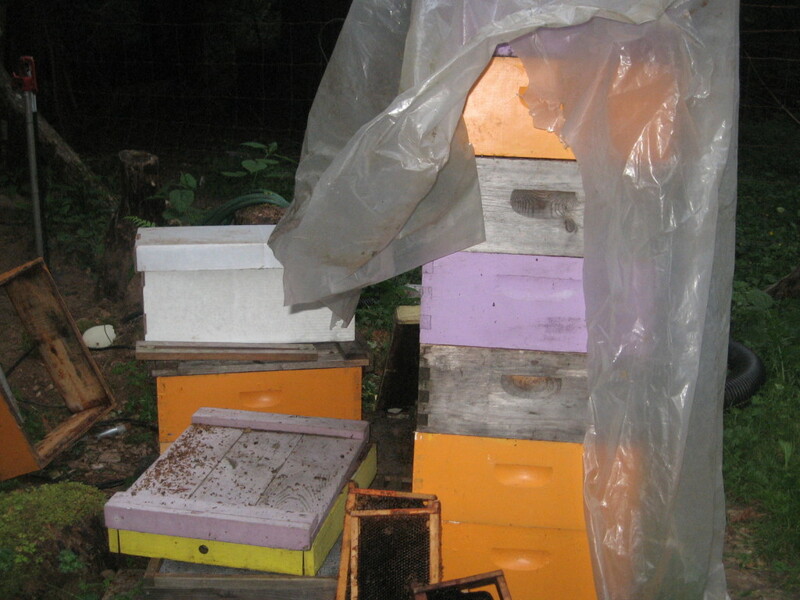 My hives have a “collar” – a 2 inch tall box where insulation lays over a piece of burlap in the winter. The insulation is removed, unless it’s a 2-story box – I figure the little ones need a bit more warmth, even in the spring. Some of the hives were fed during the February check. Some of these have now pulled in new stores (did I mention that spring has come very early here? ); some still need feed. My feed of choice is “honey patties”: crystallized, or semi crystallized, honey laid between two pieces of newspaper and laid across the top bars under the burlap. The honey comes from my hives, set aside last fall. It all takes time. I’m the slowest beekeeper in the west, I think. But it seems to work in general. 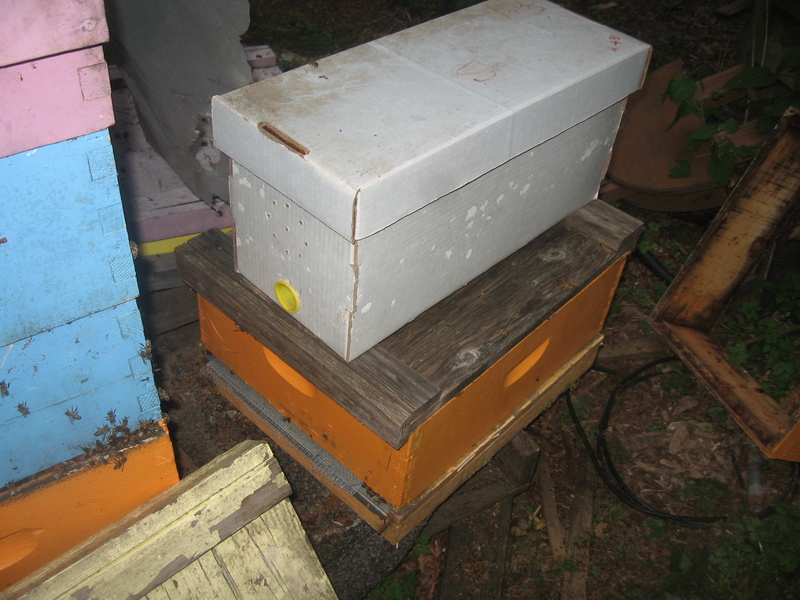 The girls kick off the spring with clean boxes, an intact brood nest, room to move up (really, mine never read the book that say bees move down), and a supply of honey. The yard looks tidy when it’s all done. You can see that one hive came through winter quite small (2-stories); one hive did fine (3-stories); and two needed to be supered already (4-stories). Same queen stock, same bees, same treatments, different results – each hive is an individual. I’m glad the spring tidy is done. I once had a few weeks to do this, but this year when the February rains stopped there were two weeks before the big leaf maples bloomed. This is the first big honey flow here, and all hives must be done before that hits – or else the bees will swarm – in March or early April – it used to snow up river at this time of year. Things change, eh? We all know that as beekeepers: nothing ever stays the same. That’s the news from Brookfield Farm Bees and Honey in Maple Falls, Washington. Next “exciting” step is to start cleaning bee boxes and frames, while putting together this year’s supers and nucs. What’s happening in your bee yards? I know Emily over at HER BLOG said seasons are moving fast in the UK (if you’ve not read her blog, check it out. It’s really, really good). Are you all seeing the seasons moving “forward” again this year? As usual you can find Brookfield Farm Bees And Honey every Sunday at two Seattle markets: The Ballard Farmers Market and the Sunday Fremont Market. I’m over at Ballard – stop by and say hi if you’re in the area. We had some clear weather at the end of February, and I took advantage of it to check the hives. For the record, Brookfield Farm Bees And Honey had a 13% loss of beehives from September to March. I’m often asked this question, but let me say that I think the number has little real meaning. I don’t like treating beekeeping like a contest, or a simple problem in mathematics. I also think percentages tend to incite competition with false feelings of triumph and failure. What Does The Hive Loss Number Mean? On the surface it’s the percentage of the number of hives that died over the number of hives that went into winter. But which hives died, which lived? Where were they? Why did they die or survive? What might have been done or not done? These are more important questions. In one agricultural bee yard I saw 28% loss. That was depressing. In another it was 17%. In two forest-area bee yards I saw zero% loss. Other bee yards ranged from 9% to 14%. So if one wanted to “play” who-did-better I could trot out the zero loss yards – I’m brilliant, my bees are great. But I could equally point to the 28% loss – I’m a fool, my bees are horrid. Neither statement is true. The lesson of numbers: Don’t compare yourself to others. Learn. Don’t compare. I keep bees in Whatcom County, Washington (state). We are the most northwest corner of Washington, west of the Cascade mountain range. Rain and snow are the weather forecast here from October to March, and often beyond (it’s pouring as I write this). The north fork of the Nooksack River runs through the area where I have bees. The hives are “down river” and “up river”. Down river is agricultural: blackberry, blueberry, raspberry, kale and corn (some organic, some conventional). The Dead Outs: These are always more interesting. Varroa is a bit harder to judge on a dead out. But no living bees had varroa. And, yes, the living bees were using the dead outs as handy feeders. I assume they started raiding before the dead outs were totally dead. a) Some hives that had been large dwindled to nothing and then starved a few inches from food. This could have been varroa. It could also be a failing queen. b) Attempts at supersedure were noted in a few hives – failed queen cells. c) Dead queens were seen in two of the hives. Tons of nice bees in some hives. Good sized clusters in others. A good amount of stores in most. No varroa visible. No drone brood to open. A bit of sealed worker brood in some, none in others. These were hives that had no bees flying. I knock on the side of the hive, put my ear to it, nothing is heard. “Dead out” I mutter. I finish the bee yard, then go back to check what killed the dead outs, only to find a nice cluster of bees in the center of the hive, happily surrounded by honey. 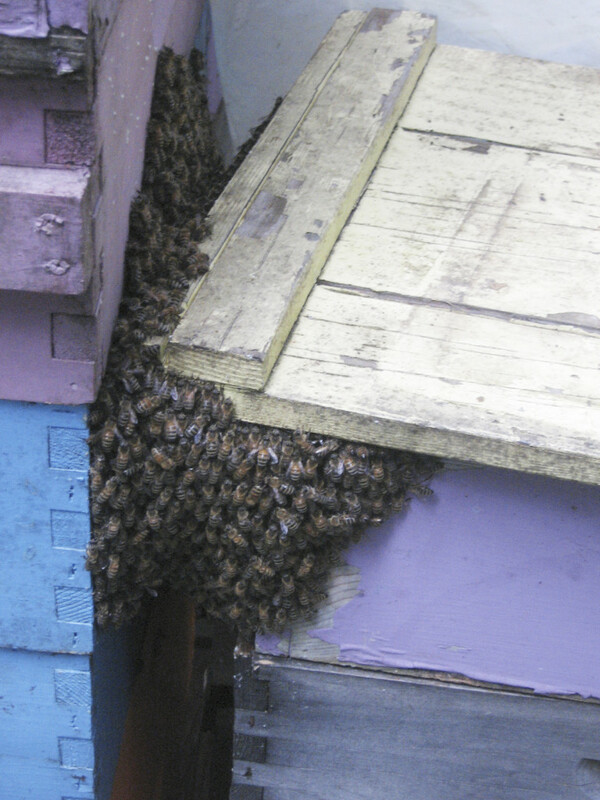 I swear I hear them shout “close the hive, lady, it’s cold out there”. About 10% of my hives needed to be fed. The bees in these hives had plowed though their 70 pounds of winter stores. These hives were noted so I would not pull larva from them for queen breeding. I feed with honey from my hives, kept back from last year’s harvest. It’s wrapped in newspaper, to keep the bees from being stuck. Yes, diseases can be spread this way. But I’m willing to take that chance over feeding cane sugar. If I run out of my own honey, I do feed cane sugar – never the honey from someone else’s hives, even if I think they have great honey (for me) and great beekeeping practices. Hives that had survived with a nice looking cluster or a great deal of bees without consuming all their stores were marked for potential future-queen-larva. I like to pull the larva from a number of hives, to get as much genetic diversity as I can in my smallholding. That’s the news from Brookfield Farm Bees And Honey in Maple Falls, Washington. Winter is not over here in the second week of March. It was pouring rain outside as I wrote this, and we had gale force winds the other night (note to self – clean gutters). Snow is falling on the lower mountains that surround us and on the high peaks 40 minutes up river. It’s wet and cold – not the optimum condition for bees. There’s a rumor that we’ll see sun in 2 weeks time. We’re 3 weeks away from the start of the first potential honey flow (Big Leaf Maples), if it doesn’t rain straight though the bloom. As usual, you can find us at two Seattle Sunday Markets, the Sunday Fremont Market and The Ballard Farmers Market. Come on down and visit if you’re in the area. How are things going in your part of the world? Any surprises, hopefully good ones, from your hives heading into spring, or into the fall?